If we want to determine star colors, calculate transformation coefficients to transform data to a standard system or obtain magnitudes of stars for which we don't have standards in the same field, we must reduce multiple observation frames together. People fortunate enough to observe in photometric conditions can use a number of packages to reduce their data. For low altitude dwellers, the selection is not that large. For them, GCX implements multiple-frame reduction routines that are designed to work in less than perfect conditions. Input data to the multi-frame reduction consists of observation reports as produced by the aperture photometry routine. For color coefficient fitting and transformation to a standard system, we need frames of the target objects taken in enough bands. For all-sky reductions, the observation reports need to have accurate time and airmass information (which implies that the original frames need to have enough information for the airmass determination). Set an starting value of the transformation coefficient. We can start with 0 without problems, as the coefficients are generally small numbers. Note that in this equation, the subscripts iterate over the stars in frame . Iterate the last two steps until the solution converges (the transformation coefficient doesn't change significantly). We have now obtained the transformation coefficient for the V magnitudes, and also adjusted all the frame zeropoints so that their dependence on the color of the standard stars in each frame is eliminated.8.2The above is repeated for each band we want to reduce. 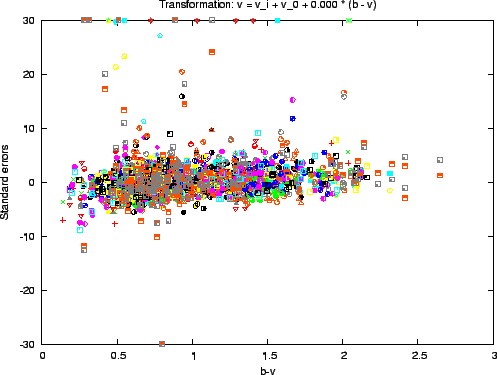 Note that we have obtained the transformation coefficients without assuming any relation between the zero points of various frames--just differential photometry. where and are any bands for which we have standards data. We can fit the transformation coefficient using only the observations. However, when we want to transform the stars, we will need observations in , , and all the bands that these depend on. To calculate the transformed standard magnitudes of our target stars, all we have to do is to write Equation (8.7) for each band, and solve the resulting system of linear equations for the standard magnitudes. The system is very well behaved (it's matrix is close to unity) so GCX uses the simple Gauss-Jordan elimination method to solve it. When the field of our intended target doesn't contain any suitable standard stars, we have to determine their magnitudes by comparing to stars in a different field. To do this, we need to determine a relation between the zeropoints of different frames. The zenital angle of a frame can be determined given it's equatorial coordinates, the geographical coordinates of the observing site, and time. 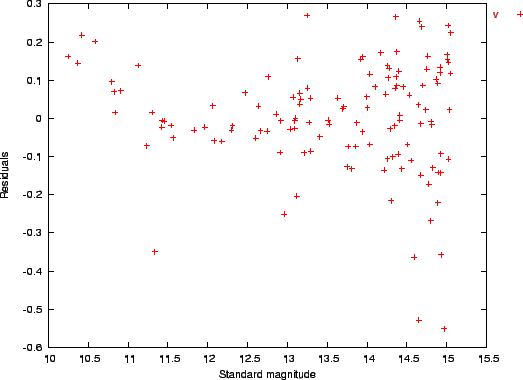 Under photometric conditions, it is customary to determine the extinction coefficient by observing the same field at different airmasses and then fitting E from (8.10). This is only possible when doesn't change (or changes in a smooth, linear fashion) over a period of the order of hours. We end up with a series of observations from different fields, all in the same general airmass range. By examining the standard fields' zeropoints variation with time and airmass, we can determine if there were any ``windows'' during which the extinction was stable. Before attempting to fit the extinction coefficient, the zeropoints and color transformation coefficient of all frames must be fitted. It is highly recommended to examine plots of the resulting zeropoints versus time and airmass to see if it's worth trying to do any all-sky reduction at all (more on this below). where is the mean airmass of the standard frames, while is the zeropoint of a mean airmass frame. A different extinction coefficient is fitted for each band. 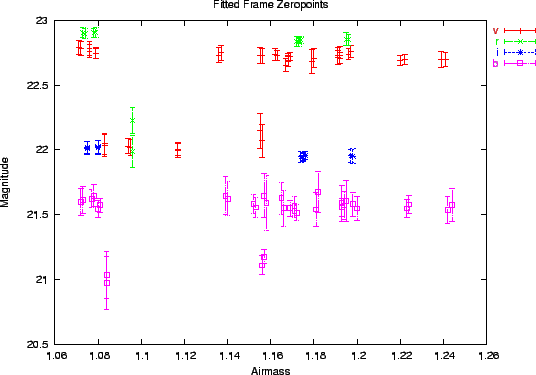 Frames that are outliers of the fit (their standard error exceeds the threshold set in Multi-Frame Photometry Options/Zeropoint outlier threshold) are marked as such. The frame's airmass has to be in the same range as the standard frames from which the extinction coefficient was fitted. This section is a step-by-step tour of the multi-frame reduction tool. An realistically-sized example input file is provided in the distribution data directory (cygs-aug19.out). This file was generated by GCX aperture photometry from 143 frames taken in B, V, R and I in a single night, all in Cygnus. The standards data is from Henden sequence files, which were converted into GCX recipies with the import function. The file consists of individual aperture photometry reports appended together. in the Bands setup option. The data to be reduced can reside in one or more files. To load data, open the the multi-frame reduction dialog using Processing/Multi-frame reduction or Ctrl-M, and select File/Add to Dataset. Select the file name and press Ok. The data from the frames contained in the file will load, and the frames will appear in the ``Frames'' tab of the dialog. More observations can be added by using Add to Dataset repeteadly.8.9 We'll assume the example file (cygs-aug19.out) is loaded for the next steps. MEU The mean error of unit weight for the zeropoint fit of the frame. Clicking on the column headers will make the program sort the list by the respective column. Clicking again will reverse the sort order. One or more frames can be selected in the list. All operations apply to the selected frames or, if none are selected, to the whole list. Flags A list of flags that apply to the star. Some are taken from the report file, some are added by the fitting routines. The bands tab shows the currently configured bands, and the various transformation coefficients relating to these bands. They only show the fitted coefficients as they resulted from the last fit operation. If only some frames were selected in that operation, then these values may only apply to those frames. 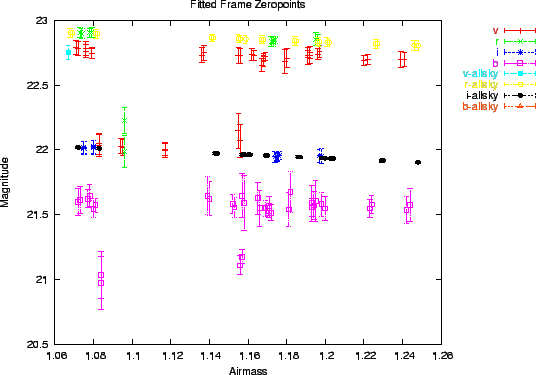 The simplest type of fit we can do is fit the zeropoints of each frame individually, without taking the other frames into consideration (like the last step in the aperture photometry routine). Even though the report files likely contained the individual fit information, it was discarded when the report was loaded. We need to perform at least this step before we can generate any plots for the data. There are two variants of this command: one zeroes all the transformation coefficients before doing the fit (Fit Zero Points with Null Coefficients), while the other will apply the current transformation coefficients to the standard stars first. (Fit Zero Points with Current Coefficients). Make sure the frames you want to fit are selected before applying the command (if no frames are selected, the command will apply to all frames). After the fit, examine the MEU column, which will show the quality of the fit (the number should be around 1.0). Since we only fitted the zeropoint, and not the color coefficients the values are slightly larger than the best than can be obtained. Figure 8.1: Residuals vesus standard magnitudes for all frames in the example data set, after zero point fitting without color transformation. Let's select the V frames (click on the band column header twice to bring the V band at the top, then click on the first V frame, and finaly shift-click on the last V frame). Now run Plot/Residuals vs Magnitude. A plot should appear that is similar to the one in Figure 8.1. 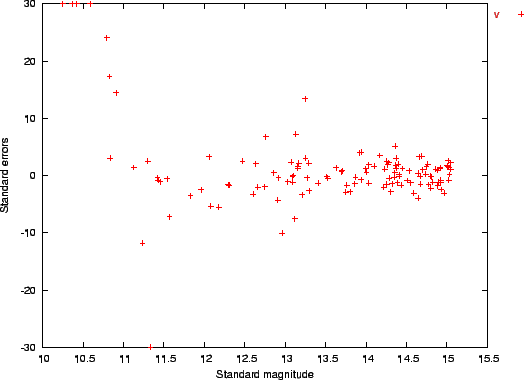 Figure 8.2: Residuals versus standard magnitudes of one AU CYG frame. 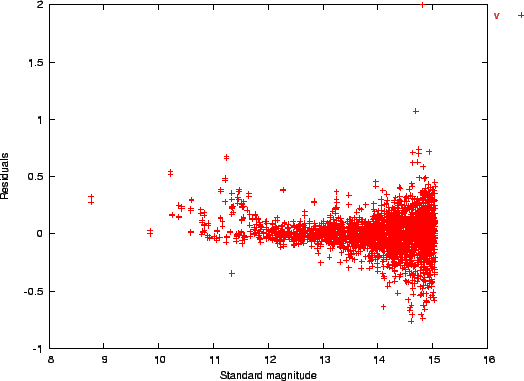 Figure 8.3: Standard errors versus magnitudes of one AU CYG frame. Figure 8.4: Standard errors vs color for the V frames, before transformation coefficient fitting. 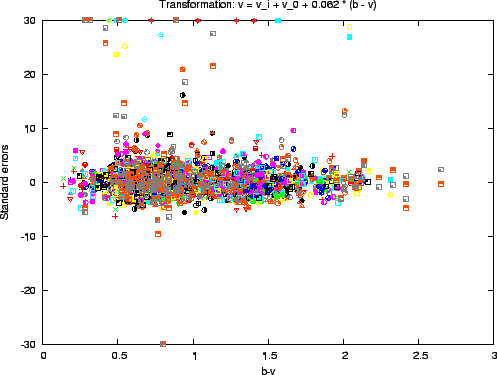 Figure 8.5: Standard errors vs color for the V frames, after transformation coefficient fitting. With the V frames selected, let's plot the standard errors again, this time against the star's color index. For this, select Plot/Standard Errors vs Color. The output should look similar to Figure 8.4. Even given the scatter of the individual observations, the plot shows a clear sloping (making the residuals proportional to the color index).8.15 To remove this slope and at the same time calculate the color transformation coefficient, we use Reduce/Fit Zero Points and Transformation Coefficients. After the fit is done, the slope is removed, as shown in Figure 8.5. The title of the figure shows the transformation used. In our case, the resulting tranformation coefficient is 0.062, a rather small figure indicating a good fit between the filters used and the standard ones. If we check the MEU fields for each frame, we will see that they have decreased, showing that the data more closely matches the standard magnitudes after the color transformation. After the fit, the list in the ``Bands'' tab is updated to show the fitted transformation coefficients and their expected errors. Note that the error is quite small in our case (0.002),8.16 even though the data seemed to spread a lot. The large number of stars used in the fit helped reduce the error considerably. A good sanity check for the transformation coefficient fit is to run the same routine on subsets of the initial data set and compare the resulting transformation coefficients. They should match within the reported error figures. Before proceeding, let's do the transformation coefficient fit for the whole dataset: Edit/Unselect All, then Reduce/Fit Zero Points and Transformation Coefficients. Figure 8.6: Zero points vs airmass for frames with standards data. 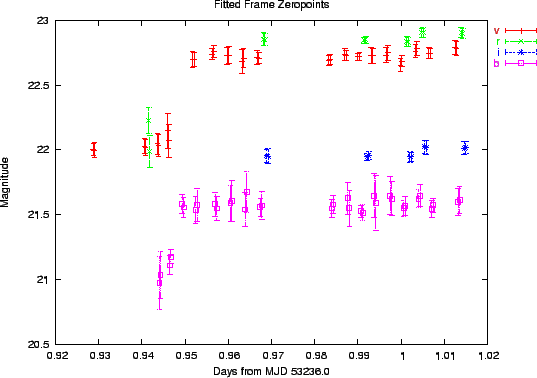 Figure 8.7: Zero points vs time for frames with standards data. The example data set contains BVRI frames for all fields. However, only some of the fields have R and I standards data. The night was clear, but conditions were changing. Let's see what we can do about the R and I frames that need all-sky reduction. We can examine the frame zero points versus the airmass, expecting them to fall on a down-sloping line.8.17 Using Plot/Zeropoints vs Airmass will produce the plot in Figure 8.6, which shows all the bands' zeropoints on the same graph. We see that most of the frames do indeed lie on down-sloping lines with a scatter consistent with their expected errors as shows by the error bars, but there are some outliers. So the conditions weren't photometric. 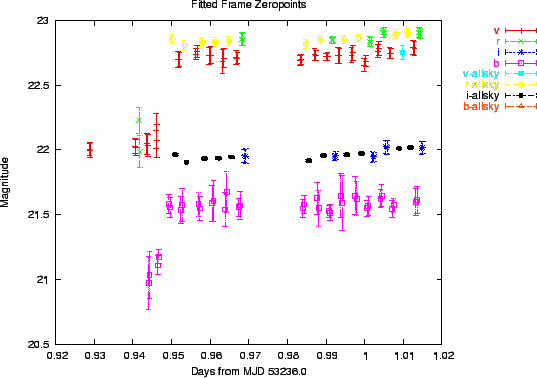 If we now plot the same zeropoints against time (Plot/Zeropoints vs Time), Figure 8.7 we can see what has happened: the transparency has improved starting at MJD 53236.95, to the point where we can use the all-sky method for frames taken after that point. Figure 8.8: Zero points vs airmass for all frames, after the extinction fit. Figure 8.9: Zero points vs time for all frames, after the extinction fit. Let's run the all-sky reduction (Reduce/Fit Extinction and All-Sky Zero Points) and generate the plots again. As we can see in Figures 8.8 and 8.9, the program has selected the frames which are bracketed by other ``good'' frames, 8.18 and calculated their all-sky zeropoints. The all-sky frames are shown with different colors. These plots should be carefully examined and any suspicious frames removed from the all-sky reduction. In our case however, it seems that the program has made a good choice of frames. After the fits are done, the complete dataset can be saved in the native format using File/Save Dataset. The native format preserves all the information in a future-proof fashion, but importing it into other applications can be a little involved. The complete format string specification can be found in Appendix E.
Finally, it is possible to list the target stars in the AAVSO format. If a validation file location is set in the File and Device Options/Aavso validation file, it will be searched for the designation of the stars. The observer code field will be filled in from the general Observation Setup Data/Observer code option.